The practice of “listening with the eyes” has a remarkably long history, which in the Western tradition of notated music can be traced back to at least the 16th century. The usage of musical figures or extramusical references leading to literature or fine art or even drawing with melodic lines could be considered a common effect of this practice. Music history, after intermedia and multimedia development in the 20th century, is now heading towards code-based performance. The crucial questions are: What is being performed: music, notation, or the process of creation? And who is the performer and who is the audience? Since the moment when music began to be visually notated, its character radically changed. Marshall McLuhan, in The Gutenberg Galaxy, called this process the schizophrenia of man (McLuhan 1969). From that time, human perception and thinking has been split between two worlds: the world of hearing and the world of sight. Musical thinking was translated from the sphere of sounds into the sphere of images. Consequentially, European culture was required to create terms such as composer, composition, and opus perfectum, signifying a closed structure. European music now had a deferred time for rethinking and reflection. During improvisation, due to the flow of time, a musician is not allowed to think extensively of the structure of the piece or of the specific relations among the musical elements. By contrast, during the process of composition, the composer is no longer bound by time. All mental operations can be performed out of time, as Iannis Xenakis pointed out in his seminal book Formalized Music (Xenakis / Kanach 1992). The whole tradition of artificial European music developed on this basis. This category of music emerged – for the above-listed reasons – more from thinking than from playing. It is music which is schizophrenically split between two worlds: the world of game (represented by a set of rational rules) and the world of play (characterized by improvised and spontaneous realization of these rules) (Eco 2002). In contradiction to the above-mentioned diagnosis, it should be said that live music has rarely existed exclusively in either a visual or an aural domain. Most recently, the electro-acoustic music of the 1950s showed that music had a more visual nature than the audience may have been willing to admit. Pure musique acousmatique was invented by Pierre Schaeffer, with the term originally derived from a description of Pythagoras’ students who were taught without seeing their teacher, called akúsmatikoi in Greek. Acousmatic music proved the importance of a theatrical or generally visual component of the musical performance through its deliberate absence. The most probable explanation of the need of the visual component is that human individuals tend to focus attention on the source of an incoming sound. Simply put, music had an audio-visual nature even before it began to be notated. But as soon as it started to be described and prescribed, it started to evolve in its own way and started to live its own life. This process was already evident, as indicated in Joachim Burmeister’s theory of rhetorical figures in music, presented in his Musica poetica (Burmeister 1606), where certain melodic models have specific semantic meaning, actually working as references to extramusical entities. This started a long tradition of “music for the eyes”, or die Augenmusik, as German nicely terms it, which was accessible exclusively to the readers of music, not to the listeners. A typical example would be the music of Czech composer Zdeněk Fibich or France’s Claude Debussy. Both draw melodic lines in their compositions as concrete visual objects. This can be seen in Pagodes from the cycle Estampes and La fille aux cheveux de lin from Préludes (1910) by Claude Debussy and in some pieces from Fibich’s piano cycle Moods, Impressions, and Reminiscences. In the 1960s, the whole process continued with graphic scores and mainly with concept scores. The latter – represented for example by John Cage – is nothing more than a set of instructions or rules of play. From the point of view of information theory, we can perceive them as algorithms. Music scores in general should be understood as analogous to software programs. They define the basic rules of a procedure, set variables (instrumentation), bring sets of musical data to be performed, and program the actions of the performers in a complex structured form. In the 19th century, under the influence of recording media (phonograph, gramophone, etc. ), the traditional communication chain was disrupted. The situation in which a composer composed a piece and then rehearsed and performed it for an audience was definitely gone. The audience lost its connection both with the composer and with the performance. The unity of a single time and place for the composer, the performance, the audience was disrupted. The audience lost its connection with the source of music. Its anthropological determinateness was shaken. In many of its manifestations, contemporary music strives to make the audience participate. The process of participation is an important means of returning to the ritual, magic, and social function of music. Furthermore, participation is one of the most important conditions of game. Source of self-motion, which is an expression of surplus. Calls for participation, which is a prerequisite of communication. Goal of the game (telos). 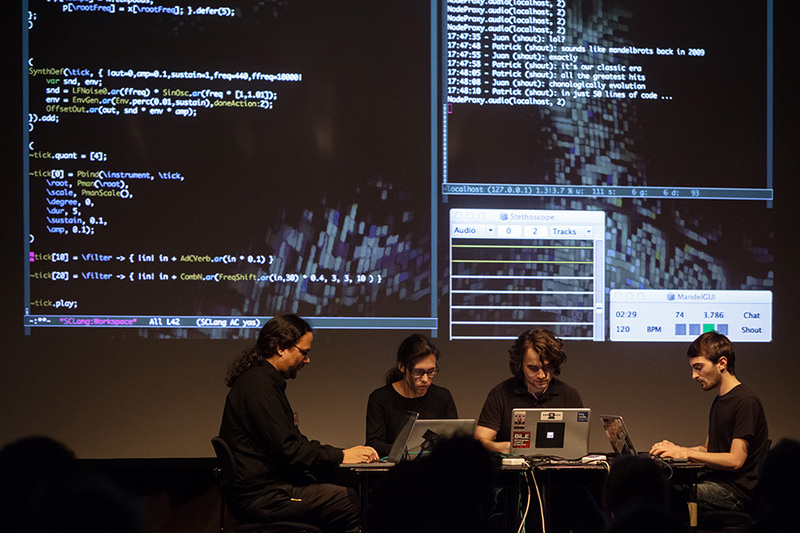 One way of re-establishing connection between the audience and the source of music by means of game is the quite recent phenomenon of live coding. Live coding represents a practice in which a software code is being written during a real-time performance by an individual or a group of programmers. The written code is projected simultaneously with the performance of the resulting sound or music. This new situation breaks the rules of traditional music, in which originally a set of instruments is given. With live coding, there is only a set of instructions which are able to create potential instruments. The programmer is simultaneously the creator of the instruments and the creator of the developing comprovisation. This term seems appropriate for the resulting structure, which is liquid and open in one way and prepared and pre-structured in another. The first live coding event took place in 1985 in Amsterdam at the STEIM festival. The performer was Ron Kuivila (Floreš 2014). Since then, many more events and festivals have taken place. Numerous collaborative projects emerged, for example The Hub or TOPLAP. There is no strong evidence that Vilém Flusser numbered music composition among his many talents. Nevertheless, the title of this chapter refers to a particular chapter in Flusser’s book Ins Universum der technischen Bilder (Flusser 1985). The chapter makes an analogy between computer mediated communication and playing chamber music. Flusser writes about the performance of a dialogic network connecting people and artificial intelligence. A more fitting description of live coding is hard to imagine. Or to be more precise, it is not a description, but should be rather understood as a prediction. Live coding provides a treatment for audio/visual schizophrenia (as diagnosed by Marshall McLuhan), which consists of merging the principles of game and play. This means that audience is able to follow the newly established rules of the game (in other words, the musical score) and at the same time their realization in the process of play. That implies that game identifies itself with play in real time. Live coding is an example of the performativity of a code. Although it is not necessary to understand programming when listening to the result, is it the code itself which is being performed. Simultaneously, the process of merging play with game means merging auditory with visual in one multimedia experience. Remediating (in the medical sense) the disruption of the communication chain means reconstructing the time-space unity of the production-reception process and concurrently re-establishing a connection between the audience and the artist. Realization of hacker ethics calling for maximum accessibility of information and transparency of programming. Bringing the element of virtuosity on the electro-acoustic music scene. Programmers exhibit their own dexterity in flowing time. Performance involves continuums of interaction, covering perhaps the scope of controls with respect to the parameter space of the artwork, or gestural content, particularly directness of expressive detail. Whilst the traditional haptic rate timing deviations of expressivity in instrumental music are not approximated in code, why repeat the past? No doubt the writing of code and expression of thought will develop its own nuances and customs. Dr. Martin Flašar, Ph.D. (flasar@phil.muni.cz) is an Assistant Professor at the Department of Musicology, Masaryk University, Brno, CZ. His research is focused on technology in art, multimedia, and 20th century music. Burmeister, Joachim. Musica poetica. Rostock 1606. Eco, Umberto. Huizinga a hra. In O zrcadlech a jiné eseje. Praha 2002. Floreš, Ivan. “Software tools programming in music performance process”. In: Where are we going and what are we doing: Electronic music today. Flašar, Martin; Matej, Daniel; Rataj, Michal (eds.). Brno 2014: 80 – 90. Flusser, Vilém. Into the Universe of Technical Images. Transl. by Nancy Ann Roth. Electronic Mediations, vol. 32. Minneapolis 2011. Gadamer, Hans-Georg. Die Aktualität des Schönen: Kunst als Spiel, Symbol und Fest. Stuttgart 1993. McLuhan, Marshall. The Gutenberg Galaxy: the making of typographic man, New York 1969. Xenakis, Iannis and Sharon E. Kanach. Formalized music: thought and mathematics in composition. Rev. ed. Stuyvesant, N.Y. 1992.